This villa defies expectations, with stunning views and a quality grill. It’s comfortable, well-renovated, and has a nicely equipped kitchen. I like how close this villa is to the coast as well. Villa Pastel is located in Pointe Milou within minutes of 2 beaches and shopping. 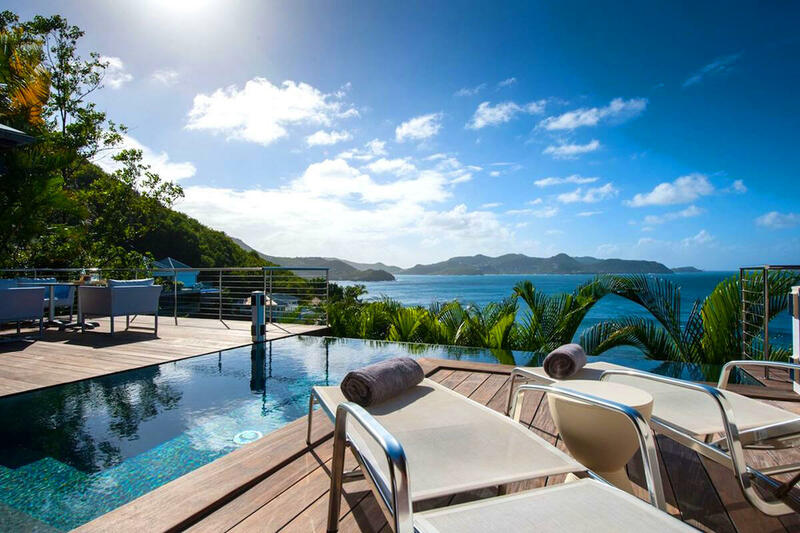 This villa is perched above the Christopher Hotel and has beautiful views of the bay and surrounding islands. The L-shaped infinity pool has a deck with a sitting area on one side, and a raised deck with loungers on the other. The BBQ grill is hidden around a corner for privacy and convenience. The outdoor and indoor areas blend seamlessly for an open-air feel throughout the villa. The interior is modern, and the living room opens completely to the terrace and pool. Large, comfortable sofas face the ocean view. The living room merges with the well-equipped kitchen and dining room, which has seating for 4 guests. A small office provides peace and quiet if guests need to work while on vacation. The house also has air-conditioning in all bedrooms and the office, WiFi, satellite DISH network, French satellite TV, and a sound system. The master bedroom is located off the living area and has a 4-poster king-size bed, private terrace, pool access, and ensuite bath with an outdoor shower. The second bedroom is located on the lower level with a 4-poster king-size bed, ensuite bath, and private terrace. Villa Pastel comes with house cleaning services six days a week, except on holidays. During the December holidays, the villa rents at the full occupancy rate regardless of how many bedrooms are used. This villa is suitable for young children, but does not allow pets. Fantastic views, well-appointed, and well-located! Villa Pastel was well-appointed and well-stocked. The views are incredible, and the pool is very pretty. The driveway is a bit tough to turn around in and is fairly steep, with an automatic gate at the end. This villa is extremely open air; the living room, kitchen, half bathroom and dining areas are all open to all of the elements and, as such, are not air-conditioned or screened. Also, the ONLY shower in the master suite is OUTSIDE, which is amazing and gorgeous, but it would be nice to have one indoors as well. The bedrooms are screened and have a/c. The villa is in an amazing location on Pt. Milou, which is our favorite place to stay on the island as it’s centrally located. The housekeeping service was wonderful, and the villa was kept very clean! We had a great time. Working with WhereToStay.com and Shawna is always a great experience. Villa stocking was perfect and we were well taken care of. Would highly recommend and have!